Commercial waste comprises of all waste generated in premises that are used for trade and business like in hotels, schools, entertainment joints, public parks, and such like. This type of waste is different from residential waste not just in terms of quantity, but also composition. Commercial waste may include anything from office waste like papers, ink cartridges, to cans and plastic bottles found in public parks, or even left over foods from a restaurant. Whatever the case, Express Waste Removals is pleased to announce to you that we provide reliable commercial waste removal services in London, we are the real pros. It doesn’t matter the nature of your business or the amount of waste that’s to be cleared. We have the skills, the means, and the passion to get the task done satisfactorily, without costing you an arm and a leg. When you give us a call or send us an email with the task at hand, our customer care teams will ask you a few questions to help us determine the way forward. What’s the nature of your business? How much waste is there to be collected, are you located on the ground floor or on the top floor? Is there any hazardous waste that requires specialized disposal? These questions are important as they help us when dispatching our professional clearance teams. 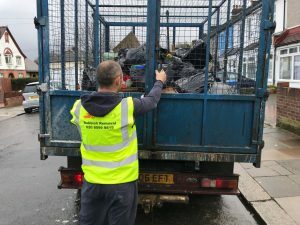 If necessary, we even send a few of our representatives to come over for a free inspection of your premises before sending over the main waste clearance teams. We don’t charge you for this, it’s more of a fact finding mission. We may give you an estimate quotation of the task at hand, although this can always be negotiated afterwards. Once we have an idea of the commercial waste that needs to be cleared, we promptly dispatch our clearance teams. It all depends on your convenience; we offer same day collection services or agree on a day to get the job done. Ours is a fully insured company and our teams are well equipped with the right tools. These include safety clothing; gloves in case they’re handling harmful waste, as well as specialized trucks that can cart away huge amounts of waste at one go. Over the years, we have learnt that most clients prefer a professional team of waste removers that causes as little interruptions to their operations as possible. Which is why our team will always clear, load, and cart away all your commercial waste without too much noise or hooliganism. We respect the sanctity of your commercial premises and it is our desire to preserve the tranquility and dignity as much as possible. Much of the waste that we collect from commercial premises often ends up in recycling plants. Office waste like damaged computers, printers, or even old carpets, damaged ovens from restaurants; these are items that are highly recyclable and Express Waste Removals has unrivaled recycling rates. On the same note, plastic bottles, cans that litter public parks after an event are also highly recyclable; entrust us with that job of clearing your garden or park after that BBQ or party you held and you won’t regret. Over the many years that we have been offering commercial; waste clearance services, we have formed crucial contacts with the top recycling plants around the city and will easily take whatever can be recycled for recycling. We also help you donate what you feel can be repaired and reused by others. For more info on how to enjoy handsome discounts each time you hire us for commercial waste removal services, just contact us now at 020 8099 9819. We’ll be glad to speak to you.